The City of Wilsonville has likely put the finishing touches on its plan to update wayfinding and destination signs throughout the community. The Wilsonville City Council considered whether to pass the Signage and Wayfinding plan at its meeting Monday, March 11, which was after the Spokesman went to press. In 2018, after the community expressed preference for the option, the City chose to use the "undulating stone" design, which is based on Willamette River features and includes "soft curves of corten steel," for the new signs. "People gravitated toward the more natural colors, the soft flowing lines, the stone and the steel," Neamtzu said. The plan calls for the City to place signs leading to over 20 destinations such as local schools, parks, trails, neighborhoods and districts and will prioritize destination signs to city centers and districts first, followed by parks and lastly other local destinations. Signs also will be placed along specific routes based on the popularity and density of the route, among other considerations. Varying signs include "confirmation signs," which tell people that they are headed toward a particular destination, turn signs and "decision signs," which show destinations and which direction to follow to get to them. There also will be different signs oriented for vehicles, bicyclists and pedestrians. "Having clear destination signs allows people to get to these destinations more easily," Neamtzu said. "We want to provide direct connection to visitors to the place they want to visit." To kick off the project, the City decided it will build six kiosks in various locations. Neamtzu said the kiosks could be implemented as soon as next year if the City decided to add the $72,000 project to its 2019-20 budget. "It seems like an engaging project to get out there. I think our residents would appreciate it. It would be something noticeable and new in the community, too," said Wilsonville Council President Kristin Akervall at the March 4 council meeting. The council also agreed to remove the old City logos on the current I-5 monument signs and replace them with the new logo without actually removing the structure itself, at least in the short term. 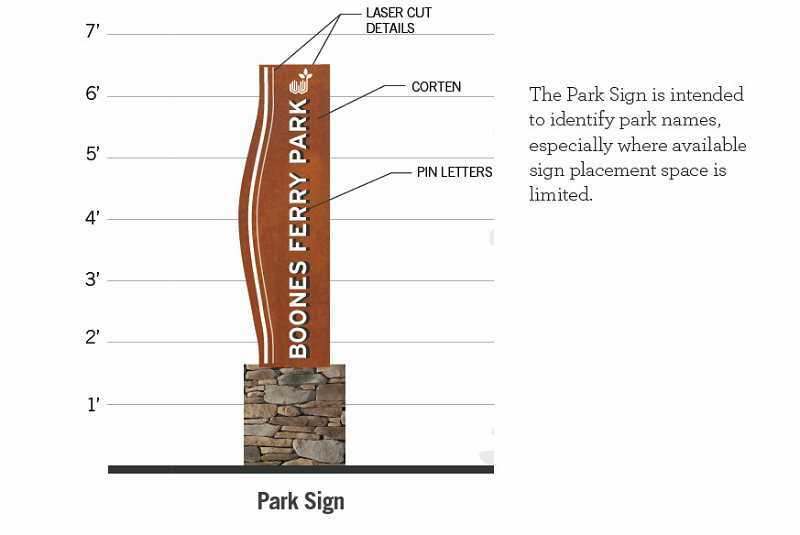 However, the plan calls for the eventual replacement of the monument signs. "My feeling about the gateway signs is they are the best-looking signage we've got, even though it doesn't match the new motif," Knapp said at the work session. Akervall agreed but wanted to switch out the logos to keep the branding consistency. "I think we're a really polished community, and I think having that (the old logo) does not speak to being polished," she said. The plan does not include a specific timeline for when the various projects will be implemented, and it will be up to the council how quickly it decides to fund the endeavors. However, it calls for signs along Wilsonville Road, Boones Ferry Road, Parkway Avenue from Elligsen Road to Town Center Loop West and renovating the gateway signs as the first projects slated for funding. "I know it's (the signage and wayfinding project) a high priority for the council," Neamtzu said.